Bars, restaurants and culture nearby. 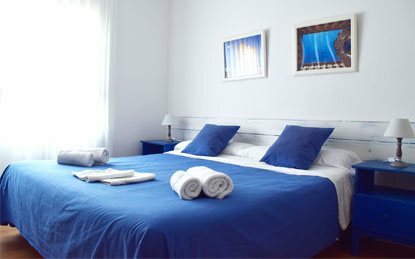 The B&B Blue Barcelona is located on Vía Augusta in Barcelona, in the famous and pretty neighborhood of Gracia. We have 10 luminous and functional rooms, each with inlaid wood flooring and a desk. Your stay includes breakfast and free WIFI available throughout the premises. We are located in a centric and well-communicated area, right next to the FGC Gracia metro stop. We are also very close to emblematic Paseo de Gracia and close to Plaza Cataluña and Sagrada Familia. You will be able to enjoy Barcelona it’s active cultural life, gastronomy, architecture… and other endless charms. In our Bed and Breakfast we will provide you with all the necessary amenities at a good price. We have 10 comfortable and inviting rooms.